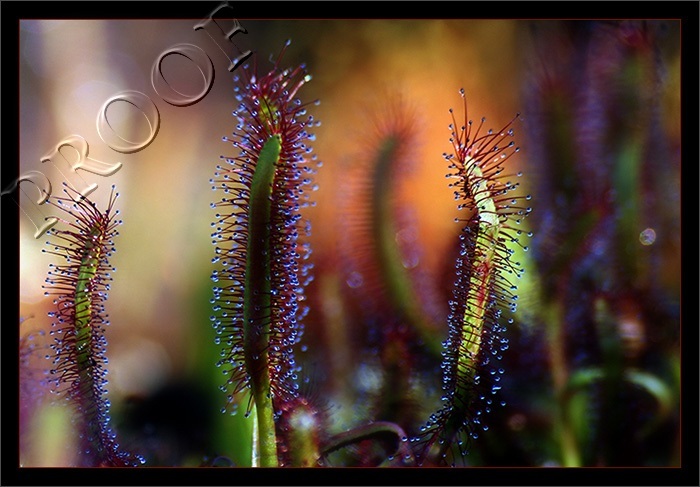 Sundew leaves have numerous tiny tentacle-like projections. At the end of each is a mucilaginous secretory gland. This gland secretes a droplet of sparkling fluid which gives the plant its dew-drop appearance. Insects, upon being attracted to the plant through odor and color, become stuck to the mucilage. With this stimulus, the tentacles begin to slowly enclose the victim. And later, in about an hour, the entire leaf itself may be bent over its prey. It has been found that these plants only respond to objects of nutritional value and not to sand, paper, or water. It also needs a title if possible. Message edited by author 2006-06-20 23:30:06. Now this is cool! Looks like something from another world! Great job! Proudly hosted by Sargasso Networks. Current Server Time: 04/23/2019 06:20:58 PM EDT.